The feature film, “Shakespeare in Love,” was a romantic fantasy about the great author – yet most Shakespeare biographies are filled with similar fantasy and speculation because so little is known about him. Furthermore, scholars have been studying Shakespeare’s plays and poems for over 200 years, but basic information about these incomparable works, like their composition dates, is still lacking. Using contemporary evidence that is often ignored or even unknown by the experts, Shakespeare Suppressed presents fresh and sometimes startling conclusions about the man and his works. The first printed edition of Romeo and Juliet was a notorious piracy. Actually, most of the earliest printed Shakespeare plays have imperfect or bad texts, which suggests they were also pirated. In Shakespeare’s sonnets and in his poem, A Lover’s Complaint, Shakespeare reveals himself as a nobleman. And at least five of Shakespeare’s contemporaries said so in print. “William Shake-speare” was the great author’s PEN NAME, which was also noted by some in the literary world. A hyphen was often put in his surname, which suggested a made-up name (a spear shaker). A man named William Shakespeare was born in Stratford-upon-Avon in 1564. He was involved with the theater, but ZERO lifetime evidence proves he was a writer. 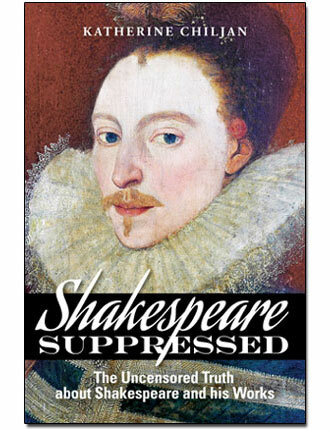 The experts say that Shakespeare plagiarized/improved the material of other writers, but new evidence presented in Shakespeare Suppressed suggests the OPPOSITE is true. The experts say that Shakespeare began writing plays circa 1590, yet clear evidence suggests he was writing as early as circa 1562 – two years BEFORE the Stratford Man was born! There is no neutral position regarding Shakespeare: either one accepts that the man born in Stratford-upon-Avon was the great author, or one accepts that “William Shakespeare” was the great author’s pen name. Shakespeare Suppressed will help you make this decision.